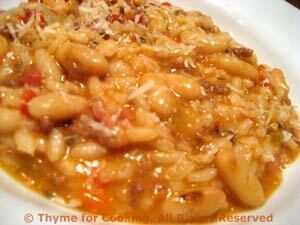 Risotto Bolognese with Fagioli, Thyme for Cooking easy Sunday Supper. The Ragù Bolognese makes a fabulously rich, gourmet risotto. Because it uses such a small amount I only make it with leftover Ragù.... but it's worth making the sauce just for this! In small saucepan heat sauce and beans, keep warm until needed. Very finally chop carrot, shallot and celery. Sauté bacon or ham, using oil if needed. Remove and set aside. In same skillet sauté carrot, shallot and celery until tender, about 10 minutes. Add tomatoes to skillet along with juices from chopping. Crumble bacon and add to skillet. Add herbs and beans, keep warm until needed.